Why use an automatic voltage regulator? Electronic systems are designed to operate based on a clean and constant supply of AC voltage. The AVR Plus provides voltage boost and buck capability to eliminate power problems created by under-voltage or over-voltage fluctuations. It also protects against minor and severe spikes and surges that comprise over 80% of power problems. Our automatic voltage regulators are ideal for products that require consistent voltage levels like automatic teller machines (ATMs), wide format digital copiers, and mailing machines. Smart Power Systems‘ AVR line eliminates intermittent rebooting, component overheating and degradation and error codes caused by voltage swells and sags. Benefits include enhanced operation, reduction in downtime and extended operating life. At Smart Power Systems, we stand behind the quality and reliability of our power protection products. 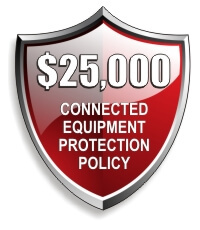 That is why we offer comprehensive $25,000 Connected Equipment Protection Policy. If the Smart Power Systems equipment fails and this failure allows a surge to pass through and damage the connected equipment, Smart Power Systems will pay for the repair or replacement of the connected equipment in accordance to Connected Equipment Protection Policy.